Embodied Movement: "Dancing for Blue: The Movement Revolution - Giving Autism a Voice"
"Dancing for Blue: The Movement Revolution - Giving Autism a Voice"
In my last visit to Singapore in April and May 2013, I gave training to about 40 students each from ITE College East (the Interact Club of ITE College East, the nursing students and students from the Community Care and Social Services course) on two separate days, 24 & 25 April 2013; and another day, 2 May 2013 to the special educators in THKMC centre to share about Dance therapy and Autism. I was firstly being approached by Rovena Plique about being a volunteer for a good cause. Rovena formed the International Dancers for Humanity (IDH4) - a network of volunteer dancers and an advocacy group utilising dance as instruments of social change. 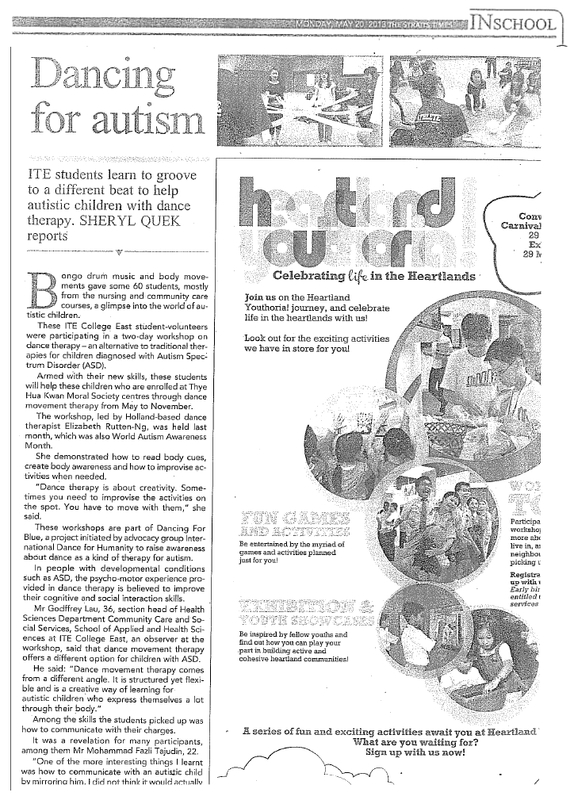 The project "Dancing for Blue" was initiated by ID4H and organised with ITE College East and the Rotary E-Club of 3310. I join them as my heart desire is to give a voice to Autism and to share about the benefits of Dance Therapy especially working with Autism. It happened to coincide with the Autism Month upon my return and thus, together with ITE college East, we launched the project. The project entails the ITE students to run movement activities with the children in the THKMC centre after the training. It is part of their community work for the society. My purpose is to encourage them to communicate with the children with autism condition, to understand and relate them from their perspectives and applying the concept and principle of Dance Therapy such as 'Mirroring' and 'Being seen'. This project was done out of my own time and love for the children. I went down to observe the children, discussed with the principal and the coordinator of ITE, to ensure the project commences in July onwards is smooth sailing before I headed back to Netherlands. I also want to thank Dawn Sim, Valerie Tan and Andrea Chen for their generous heart and time to volunteer and assist me in the training. I am proud that Dawn is on her journey in her study and Andrea has enrolled for her study this year, to join our community as our future Dance Therapists in Singapore. "One of the most interesting thing I learnt was how to communicate with an autistic child by mirroring him. I did not think it would actually work, but you are actually communicating with them,'' said the fitness training student. "Now, I understand a bit more about why they behave the way they do."